Economies of Ukraine, Turkey and EU are already interactive. Turkey obtains raw materials from Ukraine, uses them in its industry and sells the products on to different markets, including markets of the European Union. Among current Turkish imports from Ukraine are raw products, chemicals, iron, and steel. On the eve of the Turkey – Ukraine free trade area we decided to ask Chairman of the Management Board, Credit Europe Bank in Ukraine – Onur Anliatamer about economy, business and banking sector in Ukraine. (D) Many bankers believe that 2015 was almost the most challenging year for the banking system. How would you describe the economic and financial environment in which bank has to work? (Onur Anliatamer) Difficult times for Ukraine started in 2008 but 2015 as you said, was the most challenging year. Usually when the crisis starts, the impact comes after a couple of quarters maybe after a year, because at the beginning of each crisis, people already have some plan B of action, they can divert to it and it take some time for crisis to show its most difficult outcomes. I can say 2015 was a peak point as devaluation reached the highest figure, plus conflict in the East has influenced economic situation quite negatively. What is the most important from banking sector, the companies who were making proper payments faced certain problems and unfortunately some of them stopped paying their debts, which is also understandable as they can’t do business as before and most of the banks has stopped to provide new credit lines. So definitely as you said 2015 was the combination of all problems coming together and it really locked the market itself. However crises are like a wave, after reaching peak, things should start to settle down. That’s why in 2016 we’re expecting slight improvement in economy and financial environment. (D) Investment environment in Ukraine can hardly be called favorable, but nevertheless, what is the bank doing to find new customers and attract foreign investors? (Onur Anliatamer) Nowadays it is not very difficult for banks to find new clients as many banks stopped providing new credits to their existing customers, it means that these customers are now looking for new banks to work with. However risk appetite of banks is quite low and bank managers want to see and feel significant reforms regarding creditors right. We also hope for improvement in investment climate. (D) What is the rank of Credit Europa bank in Ukraine? (Onur Anliatamer) NBU periodically publishes statistics about banking sector. However nowadays these statistics are changing fast as the number of the banks is declining. As of today there are 111 banks, by asset sizes we are № 44, by equity we are 39, so I may say that we are a middle sized foreign bank. (D) How can you evaluate the bank sector and the activity of Credit Europe Bank after first quarter of 2016? (Onur Anliatamer) As I mentioned overall system is shrinking. Currently total asset size of the banking sector is around USD 50 billion. In comparison with Turkey, it is almost 10 times smaller. As an example, biggest Turkish Bank’s asset size is around USD 100 billion, which is 2 times higher than all banking sector in Ukraine. Definitely for the sake of the overall economy, growth in banking sector is necessary. To accomplish this you have two ways, – either to increase capital base or grow volume of deposits. Recently NBU increased minimum capital requirement of banks from 120 million HRN to 500 million HRN. Although this level is still a low sum to operate a bank, currently there are number of banks who cannot comply with this. The other way to increase bank’s size is to attract deposits or you can also borrow from foreign banks which is another challenge. Overall trust for banks is still very low. After recent liquidation of number of banks, Deposit guarantee fund made payments and we tried to observe where this money went. Based on our assumptions, most of this money was converted into dollars and is now being saved under pillows. On the other hand, during the latest crisis NBU was quite proactive, and implemented necessary actions to clean up the whole system. Decreasing number of banks, in my opinion, in the long run can deliver positive results, because remaining banks will be much stronger, more transparent and trustful, which will support the whole system to grow up eventually. (D) What is the strategy of Credit Europe bank in Ukraine during current year? 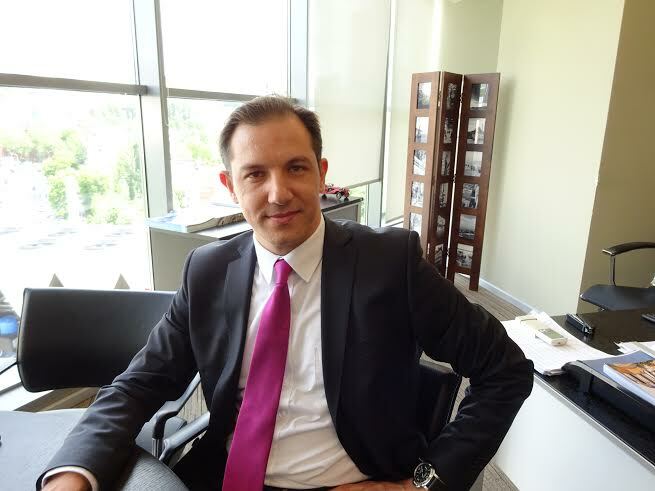 (Onur Anliatamer) We will continue to be active in corporate banking and support our clients. In 2016 I expect the economic growth will be around 1-2%. As the bank we hope to perform above this level. 2017 will be hopefully much more active year. (D) If you were the Chair of the National Bank of Ukraine what would you change in bank sector? (Onur Anliatamer ) First of all being Chair of NBU is a very hard task and Ms Gontareva is performing quite well. But I am sure she also sees major problems in the sector. Firstly it is important to restore trust to the banks, second the banks must be more active in lending. To restore trust of individuals, the level of deposit guarantee fund can be increased. Cleaning of the bank sector should be finalized and individuals should know that remaining banks in the system are safe and trustable. As mentioned, banks are hesitating to give new loans because they are afraid that although they receive sufficient collateral documentation and cover their risks on paper, they are not quite sure if any problem may occur, they will be able to foreclose this collateral. (D) Business is waiting for reforms, new government proclaimed reforms as priority. What is your opinion about new government? (Onur Anliatamer) Although they are still quite new; I should say they are active in continuing reforms. The latest visit of IMF also shows there is some improvement. Also I believe it is important to build a bridge between government and business, in this perspective business associations like American Chamber of Commerce in Ukraine, European Business Association, and Turkish – Ukrainian business associations are doing a great job. (D) How do you evaluate the Ukraine – IMF cooperation? (Onur Anliatamer) This relation has two important points. Ukraine still needs support from IMF, as of today reserves of NBU is near 14 billion dollars which cannot be regarded as a safe level. In order to raise it to safer levels, fresh funding from IMF is very critical. Also the relation with IMF is like a benchmark for other supranationals and sovereign lenders. If IMF stops working with Ukraine and suspends funds, it may create a chain effect. At this point, relations with IMF is a very delicate issue that Ukrainian government should handle. (D) What are your expectations about hryvnia currency rate for the third quarter this year? (Onur Anliatamer) A lot of factors will determine future value of Hryvnia but current level of USD/UAH rate of 25-26 will most probably remain until yearend. We also expect growth of banking sector in 2016 by 5-7%.